I’ve been a stapling fool the past few years, stapling everything from small animal fencing and shooting targets to home repair projects, using my standard array of manual staplers from major manufacturers. The problem is, as I get older, pulling the stapler trigger or handle gets rough on the old hands — so I’m taking a look at the Arrow CT50K battery-operated stapler. A 10.8V lithium ion battery powers the stapler, so you’re not held back by the length of a cord. The stapler holds standard T50 staples, two rows of them, in sizes ranging from 1/4” to 8/16”, and it’ll shoot up to 1,500 staples per charge. A white LED helps you place the staples exactly where you need them. The only thing keeping me from pulling the trigger on the CT50K is the price — with a street price of about $110 you’d have to do a lot of stapling to make it a worthy purchase. For that kind of $$$ where’s the laser? Oh, wait, it’s got an LED. Never mind. I have the Ryobi stapler/nailer that’s part of their one+ line. It works OK (not great, but OK) and uses the same battery as the rest of my tools while being about half the price of this Arrow dealy. 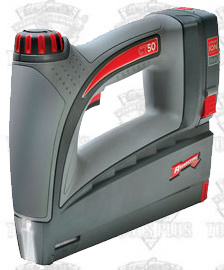 I just bought a Harbor Freight pneumatic stapler that drives T50 staples: http://www.harborfreight.com/cpi/ctaf/Displayitem.taf?itemnumber=96359 . Cost me about $30 shipped. Depth control is via regulator pressure so it’s simple and the ergonomics aren’t as nice as my PC brad nailer. But it works great. I’ve used 9/16″ staples and it buries them. And it’s cheap. I have the Ryobi One+ Stapler only. You don’t see them on the shelves much anymore but it works well. I had the stapler/nailer and took it back. They disappeared for a while but now they are back on the shelves at HD. Perhaps they improved it. The arrow CT50K is not a tool worth buying. It never drives the staple flush. The tool is seriously underpowered. If you have one don’t bother buying 1/2″ or 9/16″ staples because you’ll just have to pull them all out. The only good thing is the battery does last a long time.